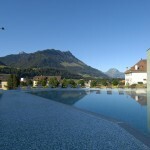 You are here: Home / Things to do / Activity guides / Montreux to Gruyères on the chocolate train. Switzerland’s most delicious trip. Sorry Willy Wonka, but you won’t want to eat your mode of transportation on The Chocolate Train tour. 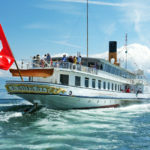 However, yes, before the day is out, you will taste delicious Swiss chocolate and cheese, and still have time to explore one of the country’s most interesting medieval towns. The Chocolate Train is one of a few trips you can take from lakeside Montreux up into alpine foothills of Fribourg canton. 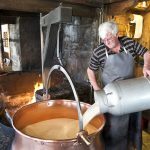 Visits to a cheese factory and chocolate factory are the tasty bookends to this day-long train and bus trip that also goes to Gruyères village. 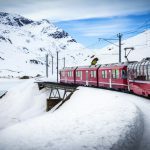 In plush velvet, brass and wood Belle Epoque 19th-century cars, the train slowly takes you up curving switchbacks into high valleys with steep walls that are either brilliant green pasture and forest cut with rock, or storybook snowfields. We took a weekend tour, which meant the train driver had to get out and manually switch the tracks at one stop. He manhandled a clanging tool nearly as long as he was to move our direction from one track to another. So what makes Gruyère cheese so uniquely yummy? The sublime beauty of these valleys and hills, according to the slightly annoying talking cow on our audio phones, but also more measurable things like her breed, what she and her sisters eat (only local grass and hay), the enzyme (from a calf’s stomach!) added to curdle the milk, and how the cheese is aged. Add other secret regional tweaks, and voilà, the famous hard Gruyère cheese. After the cheese factory, our tour went by bus up to the medieval hilltop village of Gruyères. (The village has an “s” on the end, the district does not, for some reason probably lost in the mists of antiquity.) In a country that is an embarrassment of riches when it comes to enchanting little villages, this one is way up there. In French, a grue is a crane. “Gruyères” is “the land of the cranes”, and the bird is the town’s emblem. The chateau commands the high point with views from the battlements all around the valleys. Built beginning in the 13th century, the castle is a handsome museum of its long history. A walk through its rooms takes you, sometimes rather joltingly, from the 13th century to the 18th as a medieval room leads to one with baroque furnishings. The chateau’s history is still evolving, now with art exhibits featuring modern fantastical paintings that seem oddly fitting in this fairytale castle. The village is mostly on either side of the cobblestone street below the chateau. Naturally, nearly every restaurant serves fondue with local cheese. It might be the best fondue you’ll ever have. Souvenir shops offer local crafts – kitsch, cliché and quality are in the eye of the beholder. Besides the chateau, this small village is also home to two other fascinating museums. The HR Giger Museum is as scary and hypnotizing as you might expect for the art devoted to the man who created the alien that scars our brains from the film, Alien. But this creature was only one chapter in the imagination of this amazing Swiss artist. The Tibet Museum is the yang to the yin of the Giger Museum, a celebration of peaceful Buddhist art from Tibet and the Himalayas. After a too-brief 2.5 hours to explore the village, we Chocolate Train passengers departed by bus to our last stop, the chocolate factory at historic Maison Caillers-Nestlé. The tour started off kind of creepy with a melodramatic series of dioramas showing the history of chocolate. At the place where the Aztec god Quetzalcoatl appeared with lightning, one little boy started crying. After conquistador Cortés annihilated the Aztecs and returned to Spain not with gold, but with that even more valuable treasure, we were lead to another room showing how, beginning in the 19th century, François-Louis Cailler and the other founding fathers of the Swiss chocolate business made their product world-famous. Then the tour turned to the modern production of chocolate in many forms. We got to taste cacao beans and pure cocoa butter, which is what “white chocolate” is. We learned that, in Switzerland, 75 percent of people prefer milk chocolate, 20 percent dark chocolate, and 5 percent white. And apparently, Marie Antoinette chose a cup of chocolate with her last meal. We watched a chocolate confection being made on a small demonstration machine – then got to taste the product. More tasting was just meters away – hypnotizing geometric displays of finished sculpted chocolate candies with intoxicating fillings. Some of the thousands of tourists who come through the Cailler factory tour each day get a little greedy, stuffing the free bonbons into their pockets, and forcing the beleaguered workers to plead that guests only taste here, and buy what they like in the big store up the hall. After the tour, several in our group returned to the train carrying bags packed with lots of boxes. The train began to trundle down the mountain, lulling many of us sugar-drunk passengers into a doze. Now we really were the Chocolate Train.